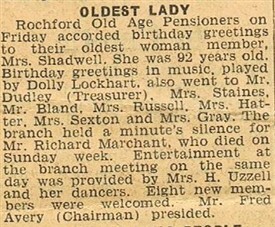 A small newspaper clipping from the Southend on sea & County pictorial, regarding my great grandmother being the oldest member of the Rochford OAP club. The article dates from January the 9th 1958. Frances Shadwell is now 92, and the oldest member of Rochford OAPs. "Oldest Lady - Rochford old age pensioners on friday accorded birthday greetings to their oldest woman member, Mrs Shadwell. She was 92 years old. Birthday greetings in music played by dolly lockhart, also went to Mr Dudley (Treasurer), Mrs Staines, Mr Bland, Mrs Russell, Mrs Hatter, Mrs Sexton, and Mrs Gray. The branch held a minutes silence for Mr Richard Marchant, who died on Sunday week. Entertainment at the branch meeting on the same day was provided by Mrs H Uzzell and her dancers. Eight new members were welcomed. Mr Fred Avery (Chairman) presided." A previous report on this site about Frances Shadwell from 1954 is at this link. This page was added by Doug Shadwell on 25/05/2016.